UNITED NATIONS, April 27 -- As the United Nations, U.S. and World Health Organization raised threat levels about swine flu, particularly in Mexico, a delegation from that country is scheduled to arrive at the UN in New York on April 29 for a session of the Security Council. Mexico holds the Council's presidency this month, and its Foreign Minister Patricia Espinosa is slated to preside over an "open debate" about Children and Armed Conflict. 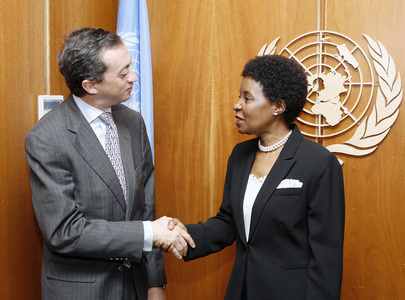 Undersecretary for Human Rights and Multilateral Affairs Juan Manuel Gomez Robledo, reported on most recently by Inner City Press in connection with Sri Lanka, will also attend, along with other Mexican officials and staff. The question is, how will the screening of those coming from Mexico impact the delegation and meeting? Another question, raised in light of the UN Medical Service scandals exposed here last week, is whether the UN would feel any duty to report to outside authorities if it discovered swine flu on its premises, technically international territory. WHO's Deputy Director General Keiji Fukuda was asked why WHO is not recommending any travel ban. Meanwhile, European Union Health Commissioner Andorra Vassiliou urged Europeans to postpone non-essential travel to the United States and Mexico “unless it is very urgent for them.” While the issue of "Children and Armed Conflict" is pressing, is Wednesday's Security Council session urgent? It is noted that the Council, among its other urgent work, considers and imposes its own travel Bans. Secretary General Ban Ki-moon on Monday made a rare appearance at the UN noon briefing, to read out a statement about swine flu. Then he said he could not take any questions, because he had an appointment at 12:10 with Norway's Minister of Environment and International development Eric Solheim. The time for that appointment had been changed. Perhaps Ban would ask Solheim about his Somalia envoy Ahmedou Ould Abdallah's acceptance of Norwegian support to prepare Somalia's Law of the Sea filing about its underwater drilling rights, a question the spokespeople for Ban and Ould Abdallah have so far refused to answer. Footnote: just as Mexico stadia saw football games played without any crowds due to quarantine, Ban Ki-moon was a veritable picture of good health on April 25 playing football or soccer with UN diplomats at Chelsea Piers. It was for the cause of children's right to play, and presided over by Children and Armed Conflict envoy Radhika Coomaraswamy. The Ambassador of Paraguay was most forceful, spectators say, while his counterpart from Liechtenstein tangled with Ban's senior advisor Kim Won-soo. How this play will play out is not yet known.